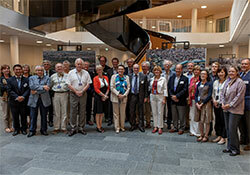 To promote and strengthen the use of research evidence for public health decision-making and to inform policies for the development of health research in the Region, WHO/Europe launched the European Advisory Committee on Health Research (EACHR) in 2011. The EACHR reports directly to the WHO Regional Director for Europe. Its functions are to advise on the formulation of policies for the development of health research; review the scientific basis of selected regional programmes; co-ordinate health research internationally across the Region’s Member States, advise on new findings on priority public health issues and evidence-based strategies to address them; and facilitate the exchange of information on research agendas in the Region and address evidence gaps in priority areas. The EACHR is the regional equivalent of the WHO Global Advisory Committee on Health Research (ACHR), which was established in 1959 by the Twelfth World Health Assembly. The Committee also provides a platform to facilitate dialogue and interaction among the public health community, research bodies and funding agencies to exchange information on research agendas in the Region and address evidence gaps for policy making. The EACHR’s rotating membership comprises around 24 public health research experts in a given year and is drawn from a range of institutions and disciplines. Members serve for three-year terms and are selected so as to ensure a balance of expertise and experience from across the Region. The role of the ACHR is to provide the Director-General with the scientific advice in relation to WHO's research programmes.